Geo.Kingsbury Machine Tools Ltd is the Engineering Division of Geo.Kingsbury Holdings group of companies, which have a turnover in excess of thirty million pounds and employ over two hundred and fifty people. The principle activities of the Engineering Division are the manufacture and sale of capital equipment for the engineering industries, and the provision of spares for, and the servicing of, machine tools. Our two specialist areas are test equipment and metalcutting machines. For over forty years we have been designing and manufacturing test equipment primarily for the automotive industry. In recent years, we have focused on end of line test stands for powertrain related assemblies. We have achieved a high level of success, working with many of the Tier 1 suppliers, installing test equipment all over the world. Electrical and mechanical engineers, employed for the manufacture of test equipment, are also used to configure metalcutting machines for any special customer requirements. The Metalcutting aspect of our business is directed at providing turnkey solutions for either precision turned parts or prismatic machined components. We have been the UK Sales and Service agent for the German built Index-Werke CNC lathes since 1956, and more recently Traub CNC lathes and Hermle 5 axis vertical machining centres. 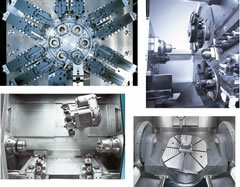 In addition to this, we manufacture our own range of very competitive MHP lathes and turning centres.